Now, obviously, the big news over the past week has been the announcement that the long-awaited ‘Crossrail for bikes’ will go ahead. But here at Cycling with Heels, I like to keep things old school. So, while everyone else has been getting excited over the promise of being able to ride across London in a fully segregated cycle lane, I’ve been getting my first real experience of the original cycle superhighways. For those not in the know, a little background. Launched back in 2010, the cycle superhighways were part of Boris’s planned ‘Cycling revolution for London’. They were intended to be a network of easily navigable, continuous cycle lanes along key commuter routes into central London. Their aim was to make cycling in London safer, and to encourage more people on their bikes. But things haven’t quite worked out as planned. Of the 12 routes originally proposed, only four – CS2, from Stratford to the City, CS3, from Barking to Tower Gateway, CS7, from Merton to the City, and CS8, from Wandsworth to Westminster – have actually been built. Right from the start, they’ve been heavily criticised – for being badly planned and executed, and for not doing enough to physically separate cyclists from the rest of the traffic. For, in effect, being little more than a strip of blue paint. Given that six cyclists have been killed on CS2 alone since its launch in 2011, I’d say there’s some truth to these criticisms. But up until last week I’ve never had chance to find out for myself – the consequence of having spent the past five years criss-crossing north London on my way to and from work. Now, though, I’ve just started a journalism course at Lambeth College. When I was working out my route, I realised I could pick up CS7 from Southwark Bridge and follow it all the way to the college’s front door, at Clapham Common. Instead of navigating the unfamiliar territory of south London, I could just follow the painted blue line. I’d read all the criticism, of course, but I wasn’t particularly concerned by it. I’m an experienced cyclist, after all. I know what to do with a badly designed cycle lane – I’ve certainly had plenty of practice. But, as I discovered, cycling along a cycle superhighway can do something odd to your instincts. 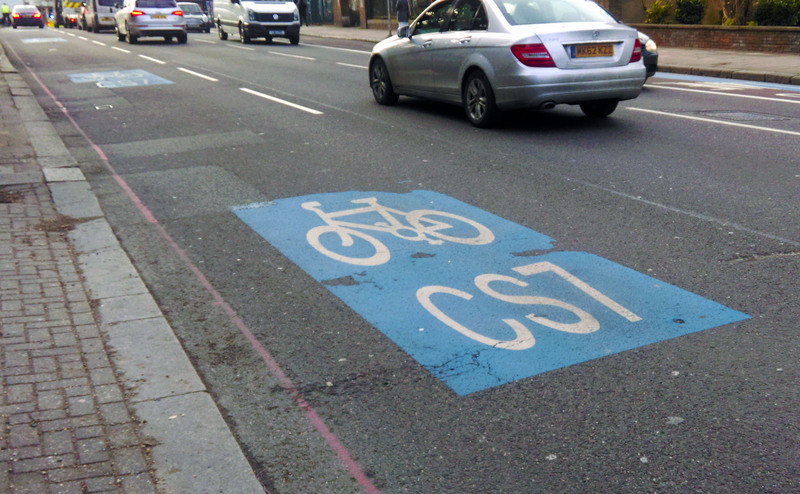 Although I ought to have known better, I kept thinking those strips of blue paint were somehow different from your average cycle lane. And so I found myself paying less attention to what was going on around me than I usually would do. I was a little less wary of cars pulling out of side streets, or passing on my right. When the cycle lane suddenly crossed lanes – as it does in a number of places, to continue going straight on while the lane of traffic turns left – I pedalled forward with just the briefest of glances over my shoulder, trusting that the traffic would give way to me. After all, it’s a cycle superhighway. It has to mean something, right? Except that it doesn’t. It doesn’t give priority to cyclists, or even any extra space. It doesn’t offer any extra protection from other road users, nor did it seem to make them any more aware of our presence. In short, there’s nothing to distinguish it from any other cycle lane except for a bit of paint and a fancy name. If even I could be fooled into thinking otherwise, I can only imagine how easy it would be for a less experienced cyclist to be lulled into a false sense of security. And that’s why it’s so important that the cycle superhighways v2.0 get built. We might then, finally, have a cycle superhighway that does what it says on the tin. The road to hell paved with good intentions?